Objectives: The heart and blood vessels are sensitive to the effects of excess thyroid hormones (THs). Echocardiography is an important investigative modality in detecting cardiac involvement in disease states and so was employed in finding out if the hyperdynamic state in thyrotoxicosis was associated with enhanced left ventricular systolic function. Methodology: Consultants in main hospitals in Enugu were requested to send in adult patients with thyrotoxicosis to the out patients department of UNTH, Enugu. The patients were recruited consecutively and diagnosis confirmed following clinical assessment and thyroid function tests. Echocardiography was done to assess enhanced left ventricular systolic function (indicated by any of these parameters VEF >75%, FS >42%, CO > 7 l/min, CI >4.3 l/min/m2, MVCF >1.9 cir/sec, PASV >120 cm/sec. Results: Thyrotoxicosis patients were leaner, had no significant difference in blood pressure when compared with controls. The patients also had significantly enhanced left ventricular systolic function when their FS (43.9%-p<0.05), CO (7.15l/min-p<0.05), and AOVMAX (144 cm/sec-p<0.05) were compared with controls. Values of free T3 also correlated positively with systolic echocardiographic parameters. Discussion and Conclusion: The effect of TH on the heart has led to interest in the therapeutic use of TH on cardiac diseases. Thyroid hormone could be used as replacement therapy in cardiac diseases in which there is background low thyroid hormone and poor systolic function or heart failure. Thyroid hormone has profound effect on many systems and metabolic process but the heart is particularly sensitive to its effects. [2-5] T3 has both direct and indirect effects on heart function. The direct effect appears to be mediated by changes in protein synthesis which then regulate myocardial gene expression. Thyroid hormone upregulates the following genes: myosin heavy-chain alpha,  Ca2+ ATpase;  Na+k+ATpase;  beta adrenergic receptor;  glucose transporter (Glut-4);  Cardiac troponin I, [11,12] and atrial natriuretic protein  thereby increasing systolic contractile function. Thyroid hormone also down-regulates the following genes: myosin heavy-chain beta, phospholamban and glucose transporter (Glut-1)  causing reduced cardiac contraction. Echocardiography has been shown to be sensitive in detecting cardiac involvement in diseased states. Echocardiographic studies of the left ventricular systolic function in thyrotoxicosis in Africa are few. To the best of our knowledge only four of such echocardiographic studies have been done in Nigeria including one by us on the Igbos who lives in the eastern part of Nigeria. [15-18] Thyrotoxicosis is a hypermetabolic and hyperdynamic cardiovascular state and so this study was designed to find out if there is enhanced left ventricular systolic function associated with this endocrine disorder. The study recruited patients with thyrotoxicosis seen consecutively over one year period in the medical outpatients of University of Nigeria Teaching Hospital. The fifty patients aged 15years or older and of both sexes included in the study were referred from the consultants in the main hospitals in Enugu city. All the study participants gave consent. The study was assessed and approved by the UNTH ethical committee in keeping with international regulations. Thyrotoxicosis was deemed to be diagnosed if there was serum – free iodothyronine > 4.2 pg/l and a concomitant suppressed thyroidstimulating hormone level <0.5 uu/ml. Left ventricular enhanced systolic function was established by any of the following: left ventricular ejection fraction (LVEF) >75%, fractional shortening (FS) >42%, cardiac index (CI) >4.3 litre/min/m2, cardiac output (CO) > 7 liters/min, mean velocity of circumferential fibre shortening (mVCF) > 1.9 cir/sec, peak aortic systolic velocity (AOVMAX) >120 cm /sec. Continuous variables were expressed as mean ± SEM. Statistical comparison was performed using Students t test. Calculations were done using SPSS software (version 11). p ≤ 0.05 was considered significant. Correlation was done were appropriate to find out if there were relationships between parameters. The baseline demographic and clinical variables of the 50 consecutive patients diagnosed with thyrotoxicosis are presented in Table 1. There were no significant differences when the mean age (43.5 ± 15.2 years) and height (160.9 ± 7.0 cm) of the thyrotoxicosis patients were compared with the age and height of the controls (44.3 ± 14.2 years and 160.3 ± 15.9 cm) respectively. However, thyrotoxicosis patients had significantly lower weight (57 ± 5.2 kg vs. 67.5 ± 8.4 kg, p<0.01) and body mass index (22.26 ± 5.6 vs. 24.2 ± 4.3 kg/m2, p<0.05) when compared with the control [Table 1a]. Table 1: (A) Anthropometric data and blood pressure of patients and controls; (B) Frequencies of symptoms in thyrotoxicosis patients. The most common symptom found among thyrotoxicosis patients was palpitation. (in 30 patients-60%). Other symptoms and their occurrences in the thyrotoxicosis patients are shown in Table 1b. Graves’ disease was the most common cause of thyrotoxicosis in this study (31 patients -62%). The mean heart rate was significantly higher in thyrotoxicosis patients: 104 bpm (range: 98-140 bpm) than in the control group 75.1 (range: 72-83 bpm), p<0.01. There was no significant difference between the systolic blood pressure and diastolic blood pressure of the thyrotoxicosis patients and the control groups. Left ventricular systolic function parameters were compared between thyrotoxicosis patients and control and shown in Table 2. Thyrotoxicosis patients had higher values than the control for left ventricular ejection fraction, fractional shortening, cardiac output, cardiac index, peak aortic systolic velocity, and velocity of circumferential fibre shortening. The differences were found to be significant (all p< 0.01) and demonstrated the presence of left ventricular enhanced systolic function in thyrotoxicosis patients. Table 2: Comparison of parameters of left ventricular systolic function between thyrotoxicosis patients and control. A comparison of values of free T3 with systolic echocardiographic parameters [Table 3] showed positive correlation as against negative correlation with TSH indices. The degree of correlation was more strongly with LVEF, AOVMAX and MVCF. Table 3: Correlation of thyroid stimulating hormone and free T3 with echocardiographic parameters. 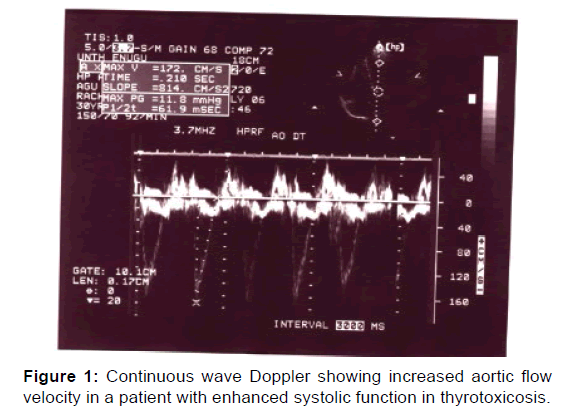 A continuous wave Doppler demonstrating increased aortic velocity in a patient with enhanced systolic function in thyrotoxicosis is shown in Figure 1. Figure 1: Continuous wave Doppler showing increased aortic flow velocity in a patient with enhanced systolic function in thyrotoxicosis. Cardiac output is increased 50 to 300% in thyrotoxicosis patients than in normal patients. This form of enhanced systolic function was found in this study as demonstrated by increase in aortic maximal forward flow velocity in 11 patients (22%) [Figure 1]. Table 2 documented the significantly increased systolic findings in the subjects studied compared with control. And Table 3 showed that thyroid hormones correlated positively with systolic function parameters supporting the evidence for enhanced systolic function. This study is the first report on enhanced systolic function in thyrotoxicosis patients in Nigeria and perhaps in sub-Saharan Africa. Friedman et al. confirmed enhanced systolic function by measuring the echocardiographic tracing of the septum and left posterior wall. Kral et al. in Czecholoslavakia  studied 12 patients with hyperthyroidism and documented significant increase in mean VCF as well as cardiac index, stroke volume and left ventricular end diastolic volume. Our study showed an increase by 17% in the mean VCF of thyrotoxicosis patients when compared with the control (1.74 vs. 1.41 circumferences/second). Marcisz et al. in Poland while studying the hyperthyroidism noted that it was associated with enhanced systolic function. They demonstrated increased left ventricular ejection function, fractional shortening, mean VCF, cardiac index and output- pressure index. Additionally there was a significant shortening of pre- ejection period, left ventricular ejection time, pre-ejection period index and left ventricular ejection time index; all these are evidences of enhanced systolic function in thyrotoxicosis patients. These values are also comparable with that obtained in animal studies involving 103 cats with hyperthyroidism in which Bond et al. showed enhancement of indices of contractility. Feldman et al. had recorded strong positive correlation between the level of thyroid hormone and the change in contractile state represented by mean VCF. Thyrotoxicosis induced heart failure has a different patho-clinical basis from the therapeutic use of thyroid hormone in heart failure. The former exposes the pathophysiological mechanism of excess thyroid hormones on the heart, and the latter exploits the therapeutic use of thyroid hormone replacement in cardiac conditions particularly if there is low thyroxine. It was found that during hypothyroidism MHC alpha mRNA was markedly lower, the MHC beta was high and the phospholamban was 10-fold higher in the hypothyroid heart when compared with euthyroid heart. When euthyroidism was restored, all changes reverted to normal and a normal cardiac function was restored. These observations are the basis of the so-called activation of a fetal gene program [70,71] secondary to the hypothyroid state. These contribute to the decreased contractile function typical of adult HF and a reversal of genotype/ phenotype to a more fetal-like cardiac state. It has been demonstrated that the activation of the fetal gene program observed during evolution of heart failure in adult life which appears to be potentially reversible when the TH profile is normalized. The restoration of a physiological thyroid hormone/thyroid receptor interaction might counteract progression of heart disease by different mechanisms including: (1) a positive remodeling through the modulation of myocardial gene expression; (2) an improvement in cardiac systolic and diastolic function with a consequent improvement in hemodynamics; (3) an improvement in myocardial perfusion and (4) a positive effect on quality of life by combining multisystem actions of the TH. The rationale for systemic administration of TH is based on the additional systemic actions of THs, in particular on skeletal muscle, kidney, and brain that could be important components of the progression from organ-limited to whole-body disease. L-T4 Administration ensures that the main physiological pathway of secretion and peripheral metabolism of TH system is preserved. Moruzzi et al. published two studies in which synthetic L-T4 was given orally at the “physiological” dose of 0.1 mg per day and cardiovascular effects were assessed after short-term (one-week) treatment and after continuous three-month treatment. [77,78] These two studies showed that L-T4 was well tolerated and induced significant improvement in cardiac pump function, consisting of enhanced resting LVEF, resting cardiac output, and functional capacity during exercise. Studies which have demonstrated enhanced systolic function in thyrotoxicosis supports the hypothesis that thyroid hormone could be useful in the treatment of heart conditions in which poor systolic function and low thyroid hormone level are present. There is increasing evidence that thyroid hormones also produce remarkable improvements in cardiac remodeling, including beneficial changes in myocyte shape, microcirculation, and collagen. There is need for more studies in large populations to help map out clearly the indications for thyroid replacement therapy in patients with and without cardiac disease. This is important particularly since there are presently very few new drug discoveries in the area of heart failure pharmacotherapy. The author discloses that he has no conflicts of interest. Dillman WH. Biochemical basis of thyroid hormone action in the heart. Am J Med. 1990;88:626-627. Polikar R, Burger AG, Scherrer U, Nicod P. The thyroid and the heart. Circulation. 1993;1435-1437. Davis PJ, Davis FB. Acute cellular actions of thyroid hormone and myocardial function. Ann Thoracic Surg. 1993;56:S16-S17. Dillman WH. Cardiac function in thyroid disease: Clinical features and management considerations. Ann Thorac Surg. 1993;56:S9-S10. Rohrer D, Dillmann WH, Thyroid hormone markedly increases the mRNA coding for sarcoplasmic reticulum Ca2 -ATPase in the rat heart. J BioChem. 1988;263:6941-6944. Tsika RW, Bahl JJ, Leinwand LA, Morkin E. Thyroid hormone regulates expression of a transfected human alpha myosin heavy chain fusion gene in fetal rat heart cells. Proc Natl Acad Sci USA. 1990;87:379-381. Zarina-Herzberg A, Marques J, Sukovich D, Periasamy M. Thyroid hormone receptor modulates the expression of the rabbit cardiac sarcoendoplasmic reticulum Ca(2+)-ATPase gene. J Biol Chem.1994;269:1460-1461. Orlowski J, Lingrell JB. Thyroid and glucocorticoid hormones regulate the expression of multiple Na, K-ATPase genes in cultered neonatal rat cardiac myocyte. J Biol Chem. 1990;265:3462-3464. Bahouth SW. Thyroid hormones transcriptionally regulates the b-1 adrenergic receptor gene in cultured ventricular myocyte. J Biol Chem. 1991;266:15863-15864. Castelló A, Rodríguez-Manzaneque JC, Camps M, Pérez-Castillo A, Testar X, Palacín M, et al. Perinatal hypothyroidism impairs the normal transition of GLUT4 and GLUT1 glucose transporters from fetal to neonatal levels in heart and brown adipose tissue. Evidence for tissue-specific regulation of GLUT4 expression by thyroid hormone. J Biol Chem. 1994;269:5905-5906. Averyhart-Fullard V, Fraker LD, Murphy AM, Solaro RJ. Differential regulation of slow-skeletal and cardiac troponin I mRNA during development and by thyroid hormone in rat heart. J Mol Cell Cardiol. 1994;26:609-611. Dieckman LJ, Solaro RJ. Effect of thyroid status on thin-filament Ca2+ regulation and expression of troponin I in perinatal and adult rat hearts. Circ Res. 1990;67:344-346. Fullerton MJ, Stuchbury S, Krozowski ZS, Funder JW. Altered thyroidal status and the in vivo synthesis of atrial natriuretic peptide in the rat heart. Mol Cell Endocrinol. 1990;69:227-229. Park KW, Dai HB, Ojamaa K. The direct vasomotor effect of thyroid hormones on rat skeletal muscle resistance arteries. Anesthesia Annals. 1997;85:734-738. 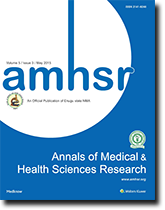 Kolawole BA, Balogun MO, Akinsola A. Thyrotoxicosis and heart-a review of the literature. Nigerian Journal of Medicine. 2001;16:50-54. Danbauchi SS, Anumah FE, Alhassan MA, Oyati A, Isah HS, Onyemelukwe GC, et al. Thyrocardiac Disease in Zaria: Clinical and Echocardiographic Characteristics. E-chocardiography Journal. 2004;2:1-5. Ogbera A, Isiba A. The scope of cardiac complications of thyrotoxicosis in Lagos, Nigeria. Endocrine Absracts. 2007;13:301. Anakwue RC, Onwubere BJC, Anisiuba BC, Ikeh VO, Mbah AU, Ike SO. Congestive heart failure in subjects with thyrotoxicosis in a black community Vascular Health and Risk Management. 2010;6:473-477. Klein I, Ojama K. Thyroid hormone and the cardiovascular system. The New England J of Med. 2001;344:501-509. Sahn DJ, DeMaria A, Kisslo J, Weyman A. Recommendations regarding quantitation in M-mode echocardiography: Results of a survey of echocardiuographic measurements. Circulation. 1978;58:1072. Everts ME, Verhoeven FA, Bezstarosti K, Moerings EP, Hennemann G, Visser TJ, et al. Uptake of thyroid hormone in neonatal rat cardiac myocytes. Endocrinology. 1996;137:4235-4242. Brent GA. The molecular basis of thyroid hormone action. N Engl J Med. 1994;331:847-853. Morkin E. Regulation of myosin heavy chain genes in the heart. Circulation. 1993;87:1451-1460. Ojamaa K, Klemperer JD, Klein I. Acute effects of thyroid hormone on vascular smooth muscle. Thyroid. 1996a;6:505-512. Dillmann WH. Biochemical basis of thyroid hormone action in the heart. Am J Med. 1990;88:626-630. Kiss E, Jakab G, Kranias EG, Edes I. Thyroid hormone induced alteration in phospholamban protein expression: regulatory effects on sarcoplasmic reticulum Ca2+ transport and myocardial relaxation. Circ Res. 1994;75:245-251. Friedman MJ, Okada RD, Ewy GA, Hellman DJ. Left ventricular systolic and diastolic function in hyperthyroidism. American Heart Journal. 1982;104:6:1303-1308. Kral J, Hradec J, Limanova J. Heart in thyroid diseases. Cor Vasa. 1992;34:108-114. Marcisz C, Kucharz EJ, Jonderko G, Wojewódka J. The Systolic function of the Left Ventricle of heart in patients with hyperthyroidism during therapy. Pol Arch Medicine Wewn. 2001;105:131-138. Bond BR, Fox PR, Peterson ME, Skavaril RV. Echocardiographic findings in 103 cats with hyperthyroidism, Journal of American Veterinarian Medical Association. 1988;192:1546-1549. Feldman T, Borrow KM, Sarne DH, Neumann A, Lang RM. Myocardial mechanics in hyperthyroidism: Importance of left ventricular loading conditions, heart rate and contractile state. Journal of American College of Cardiology. 1986;7:972. Gerdes AM, Iervasi G. Thyroid replacement therapy and heart failure. Circulation. 2010;122:385-393. Siu C, Yeung C, Lau C, Kung AWC, Tse H. Incidence, clinical characteristics and outcome of congestive heart failure as the initial presentation in patients with hyperthyroidism. Heart. 2007;93:483-487. Chen WJ, Lin KH, Lee YS. Molecular characterization of myocardial fibrosis during hypothyroidism: Evidence for negative regulation of the pro-alpha1(I) collagen gene expression by thyroid hormone receptor. Mol Cell Endocrinol. 2000;162:45-55. Yao J, Eghbali M. Decreased collagen gene expression and absence of fibrosis in thyroid hormone-induced myocardial hypertrophy: Response of cardiac fibroblasts to thyroid hormone in vitro. Circ Res. 1992;71:831-839. Tang YD, Kuzman JA, Said S, Anderson BE, Wang X, Gerdes AM. Low thyroid function leads to cardiac atrophy with chamber dilatation, impaired myocardial blood flow, loss of arterioles, and severe systolic dysfunction. Circulation. 2005;112:3122-3130. Biondi B, Cooper DS. The clinical significance of subclinical thyroid dysfunction. Endocr Rev. 2008;29:76-131. Surks MI, Ortiz E, Daniels GH, Sawin CT, Col NF, Cobin RH, et al. Subclinical thyroid disease: scientific review and guidelines for diagnosis and management. JAMA. 2004;291:228-238. Iervasi G, Molinaro S, Taddei MC, Galli E, Mariani F, et al. Association between increased mortality and mild thyroid dysfunction in cardiac patients. Arch Intern Med. 2007;167:1526-1532. Friberg L, Drvota V, Bjelak AH, Eggertsen G, Ahnve S. Association between increased levels of reverse triiodothyronine and mortality after acute myocardial infarction. Am J Med. 2001;111:699-703. Pingitore A, Landi P, Taddei MC, Ripoli A, L’Abbate A, Iervasi G. Triiodothyronine levels for risk stratification of patients with chronic heart failure. Am J Med. 2005;118:132-136. Iervasi G, Pingitore A, Landi P, Raciti M, Ripoli A, Scarlattini M. Low-T3 syndrome: A strong prognostic predictor of death in patients with heart disease. Circulation. 2003;107:708-713. Hamilton MA, Stevenson LW, Luu M, Walden JA. Altered thyroid hormone metabolism in advanced heart failure. J Am Coll Cardiol. 1990;16:91-95. Biondi B, Palmieri EA, Lombardi G, Fazio S. Effects of subclinical thyroid dysfunction on the heart. Ann Intern Med. 2002;137:904-914. Hak AE, Pols HA, Visser TJ, Drexhage HA, Hofman A, Witteman JC. Subclinical hypothyroidism is an independent risk factor for atherosclerosis and myocardial infarction in elderly women: The Rotterdam Study. Ann Intern Med. 2000;132:270-278. Kvetny J, Heldgaard PE, Bladbjerg EM, Gram J. Subclinical hypothyroidism is associated with a low-grade inflammation, increased triglyceride levels and predicts cardiovascular disease in males below 50 years. Clin Endocrinol (Oxf). 2004;61:232-238. Razvi S, Ingoe L, Keeka G, Oates C, McMillan C, Weaver JU. The beneficial effect of l-thyroxine on cardiovascular risk factors, endothelial function, and quality of life in sub-clinical hypothyroidism: Randomized, crossover trial. J Clin Endocrinol Metab. 2007;92:1715-1723. Asvold BO, Bjoro T, Nilsen TI, Gunnell D, Vatten LJ. Thyrotropin levels and risk of fatal coronary heart disease: the HUNT study. Arch Intern Med. 2008;168:855-860. Silva-Tinoco R, Castillo-Martinez L, Orea-Tejeda A, Orozco-Gutiérrez JJ, Vázquez-Díaz O, Montaño-Hernández P. Developing thyroid disorders is associated with poor prognosis factors in patient with stable chronic heart failure. Int J Cardiol. 2011;147:e24-e25. Iacoviello M, Guida P, Guastamacchia E, Triggiani V, Forleo C, Catanzaro R. Prognostic role of sub-clinical hypothyroidism in chronic heart failure outpatients. Curr Pharm Des. 2008;14:2686-2692. Vanderpump MP. How should we manage patients with mildly increased serum thyrotrophin concentrations? Clin Endocrinol (Oxf) 2009. Klein I, Ojamaa K. Thyroid hormone and the cardiovascular system. N Engl J Med. 2001;344:501-509. Iervasi G, Molinaro S, Landi P, Taddei MC, Galli E, Mariani F. Association between increased mortality and mild thyroid dysfunction in cardiac patients. Arch Intern Med. 2007;167:1526-1532. Friberg L, Werner S, Eggertsen G, Ahnve S. Rapid down-regulation of thyroid hormones in acute myocardial infarction: Is it cardioprotective in patients with angina? Arch Intern Med. 2002;162:1388-1394. Asvold BO, Vatten LJ, Nilsen TI, Bjøro T. The association between TSH within the reference range and serum lipid concentrations in a population-based study: The HUNT Study. Eur J Endocrinol. 2007;156:181-186. Franklyn JA, Gammage MD, Ramsden DB, Sheppard MC. Thyroid status in patients after acute myocardial infarction. Clin Sci (Lond). 1984;67:585-590. Holland FW II, Brown PS Jr, Weintraub BD, Clark RE. Cardiopulmonary bypass and thyroid function: a "euthyroid sick syndrome." Ann Thorac Surg. 1991;52:46-50. Klemperer JD, Klein I, Gomez M, Helm RE, Ojamaa K, Thomas SJ, et al. Thyroid hormone treatment after coronary-artery bypass surgery. N Engl J Med. 1995;333:1522-1527. Bettendorf M, Schmidt KG, Tiefenbacher U, Grulich-Henn J, Heinrich UE, Schönberg DK. Transient secondary hypothyroidism in children after cardiac surgery. Pediatric research. 1997;41:375. Pantos C, Mourouzis I, Cokkinos DV. Thyroid hormone as a therapeutic option for treating ischaemic heart disease: From early reperfusion to late remodelling. Vascular Pharmacology. 2010;52:157-165. Henderson KK, Danzi S, Paul JT, Leya G, Klein I, Samarel AM. Physiological replacement of T3 improves left ventricular function in an animal model of myocardial infarction-induced congestive heart failure, Circulation: Heart Failure. 2009;2:243-252. Chen YF, Kobayashi S, Chen J, Redetzke RA, Said S, Liang Q, et al., Short term triiodo-L-thyronine treatment inhibits cardiac myocyte apoptosis in border area after myocardial infarction in rats. Journal of Molecular and Cellular Cardiology. 2008;44:180-187. Pantos C, Mourouzis I Markakis K Dimopoulos A, Xinaris C, Kokkinos AD, et al. Thyroid hormone attenuates cardiac remodeling and improves hemodynamics early after acute myocardial infarction in rats. European Journal of Cardio-thoracic Surgery. 2007;32:333-339. Pantos C, Mourouzis I, Markakis KN, Tsagoulis N, Panagiotou M, Cokkinos DV. Long-term thyroid hormone administration reshapes left ventricular chamber and improves cardiac function after myocardial infarction in rats. Basic Research in Cardiology 2008;103:308-318. Forini F, Lionetti V, Ardehali H, Pucci A, Cecchetti F, Ghanefar M, et al. Early long-term L-T3 replacement rescues mitochondria and prevents ischemic cardiac remodelling in rats. Journal of Cellular and Molecular Medicine. 2011;15:514-524. Kalofoutis C, Mourouzis I Galanopoulos G, Dimopoulos A, Perimenis P, Spanou D, et al. Thyroid hormone can favorably remodel the diabetic myocardium after acute myocardial infarction. Molecular and Cellular Biochemistry. 2010;345:161-169. Pantos C, Mourouzis I, Tsagoulis N, Markakis K, Georgios G, Nikolaos R, et al. Thyroid hormone at supra-physiological dose optimizes cardiac geometry and improves cardiac function in rats with old myocardial infarction. Acta physiologica Polonica. 2009;12:49. Ladenson PW, Sherman SI, Baughman KL, Ray PE, Feldman AM. Reversible alterations in myocardial gene expression in a young man with dilated cardiomyopathy and hypothyroidism. Proceedings of the National Academy of Sciences. 1992;89:5251-5255. Colucci WS. Molecular and cellular mechanisms of myocardial failure. The American Journal of Cardiology. 1997;80:15L-25L. Khalife WI, Tang YD, Kuzman JA, Thomas TA, Anderson BE, Said S, et al. Treatment of subclinical hypothyroidism reverses ischemia and prevents myocyte loss and progressive LV dysfunction in hamsters with dilated cardiomyopathy. American Journal of Physiology-Heart and Circulatory Physiology. 2005;289:H2409-H2415. Hamilton MA, Stevenson LW, Fonarow GC, Steimle A, Goldhaber JI, Child JS, et al. Safety and hemodynamic effects of intravenous triiodothyronine in advanced congestive heart failure. The American journal of cardiology. 1998;81:443-447. Moruzzi P, Doria E, Agostoni PG. Medium-term effectiveness of L-thyroxine treatment in idiopathic dilated cardiomyopathy. The American Journal of Medicine. 1996;101:461-467. Iervasi G, Emdin M, Colzani RM, Placidi S, Sabatino L, Scarlattini M, et al. Beneficial effects of long-term triiodothyronine (T3) infusion in patients with advanced heart failure and low T3 syndrome. InProceedings of the 2nd International Congress on Heart Disease—New Trends in Research, Diagnosis and Treatment. 2001;549-553. Trivieri MG, Oudit GY, Sah R, Kerfant BG, Sun H, Gramolini AO, et al. Cardiac-specific elevations in thyroid hormone enhances contractility and prevent pressure overload-induced cardiac dysfunction. Proceedings of the National Academy of Sciences. 2006;103:6043-6048. Belke DD, Gloss B, Swanson EA, Dillmann WH. Adeno-associated virus-mediated expression of thyroid hormone receptor isoforms-α1 and-β1 improves contractile function in pressure overload-induced cardiac hypertrophy. Endocrinology. 2007;148:2870-2877. Moruzzi P, Doria E, Agostoni PG, Capacchione V, Sganzerla P. Usefulness of L-thyroxine to improve cardiac and exercise performance in idiopathic dilated cardiomyopathy. American Journal of Cardiology. 1994;73:374-378. Moruzzi P Doria E, Agostoni PG. Medium-term effectiveness of L-thyroxine treatment in idiopathic dilated cardiomyopathy. American Journal of Medicine. 1996;101:461-467. Goldman S, McCarren M, Morkin E, Ladenson P, Edson R, Warren S, et al. DITPA, a thyroid hormone analog to treat heart failure: phase II trial VA cooperative study. Journal of Cardiac Failure. 2008;14:796. Pingitore A, Iervasi G, Gerdes MA. Letter by Pingitore et al. regarding article, "DITPA (3,5-diiodothyropropionic acid), a thyroid hormone analog to treat heart failure: phase II trial Veterans Affairs cooperative study. Circulation. 2010;121:240. Ito K, Kagaya Y, Shimokawa H. Thyroid hormone and chronically unloaded hearts. Vascul Pharmacol. 2010;52:138-141. Khait L, Birla RK. Effect of thyroid hormone on the contractility of self-organized heart muscle. In vitro Cell Dev Biol Anim. 2008;44:204-213.